Misao Okawa, a Japanese woman recognised by Guinness World Records as the world's oldest living person died on Wedneday, nearly a month after celebrating her 117th birthday. Okawa, died of natural causes this morning at a nursing home in Osaka, nursing home officials said. Okawa was born to the family of a kimono shop owner in Osaka on March 5, 1898, the same year the US annexed the Hawaiian Islands and Pepsi-Cola was launched, 'Kyodo' news agency reported. Okawa had credited her longevity to eating sushi and getting at least eight hours sleep a night. 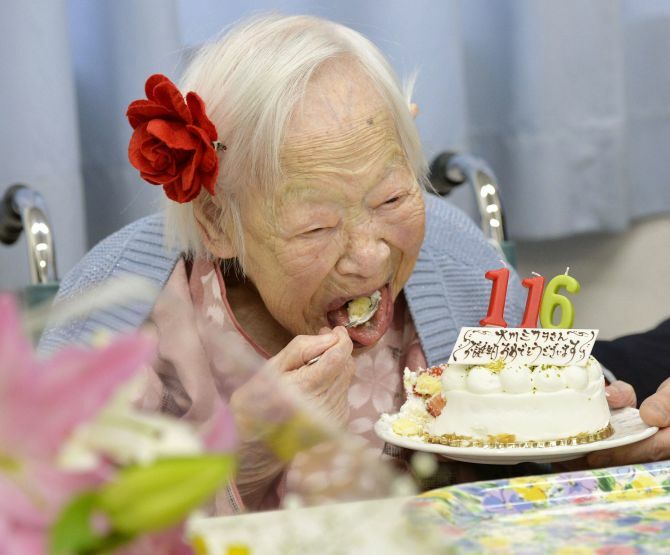 Her 117th birthday celebrations last month were televised across Japan. Okawa had said that 117 years did not seem like such a long time. According to staff at the Kurenai retirement home where she lived, she had slowed down in recent months and was having trouble hearing. Okawa took the title of world's oldest living person in June 2013 following the death of Jiroemon Kimura -- also from Japan -- who passed away at the age of 116. The world's oldest person is now Gertrude Weaver of the US, who will turn 117 on July 4. Okawa married in 1919; her husband, Yukio, ran his own business in Kobe and together they had three children -- two daughters and a son. After the passing of her husband in June 1931, she moved back to Osaka, surrounded by her children, 4 grandchildren and 6 great grandchildren. Okawa lived across 3 centuries, which have seen immense social and technological advances including the advent of motor vehicles, flight, mobile telephones, social networking sites and six UK monarchs, four emperors of Japan and 20 US Presidents. The oldest person ever to have lived is also female, Jeanne Calment of France, who lived to 122 years and 164 days.